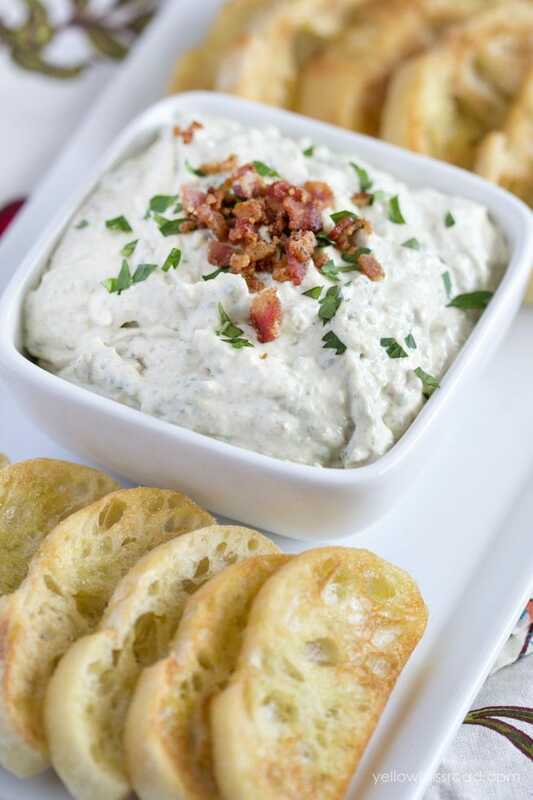 Sweet caramelized onions, creamy and tangy goat cheese are combined with fresh herbs and bacon to form a creamy, savory dip that’s perfect for summer. 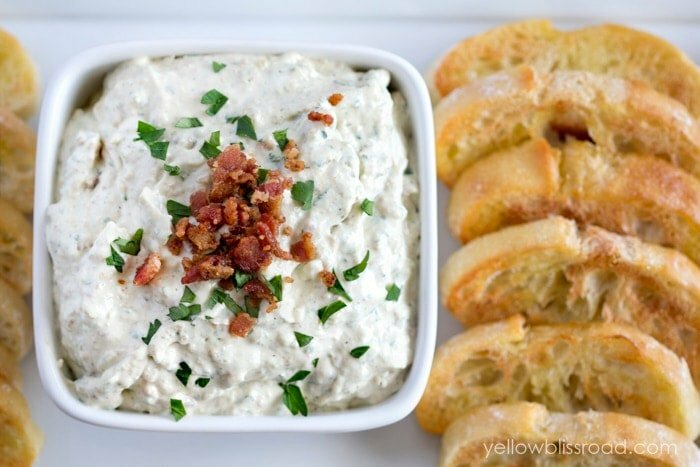 Goes great with potato chips, veggies or crostini. The other day I tried a new chicken sandwich at out favorite local restaurant Red Robin. Well, I should say it’s my kids favorite – I could take it or leave it! Anyway this new chicken sandwich had goat cheese and red peppers, sweet onion straws, bacon and goat cheese. Lordy, it was so good! I vowed to recreate it because I figured you might like it too! Well obviously this isn’t a chicken sandwich. I bought everything to make the sandwich – peppers, bacon, onions, goat cheese, ciabatta bread…but I forgot the chicken. How exactly does one run out of chicken and not know it? I have no idea. But I did, so I had to improvise. 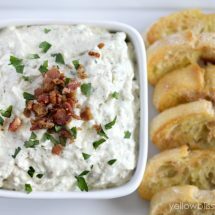 I have been wanting to add some more appetizer and dip recipes to the blog, and I thought the goat cheese would make a nice base for a creamy dip. Boy was I right! First I cooked up the bacon, then I caramelized some diced onions in a little of the bacon grease over low heat. It takes a while for this method but it really brings out the sweetness in the onion. Then I combined the goat cheese with some sour cream and a little bit of mayonnaise until it was nice and smooth. 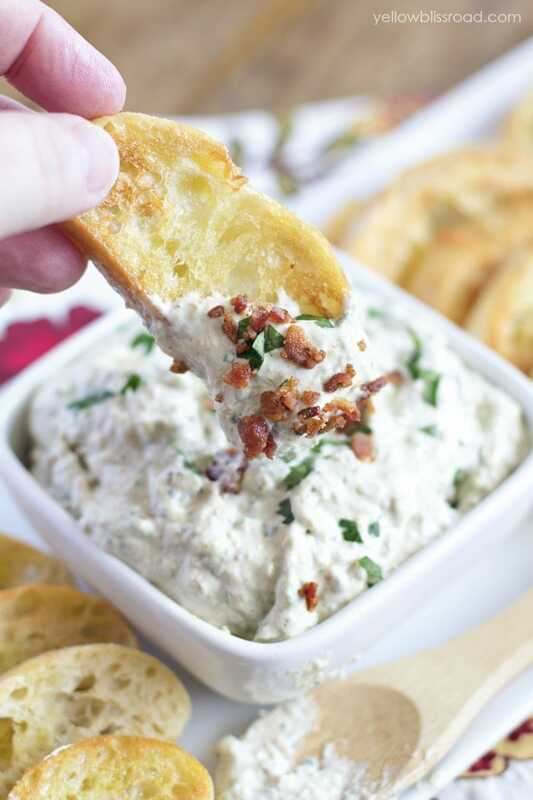 I added some garlic salt and fresh parsley, along with the cooled onions and crumbled bacon and pulsed it all together in my food processor until I liked the consistency. 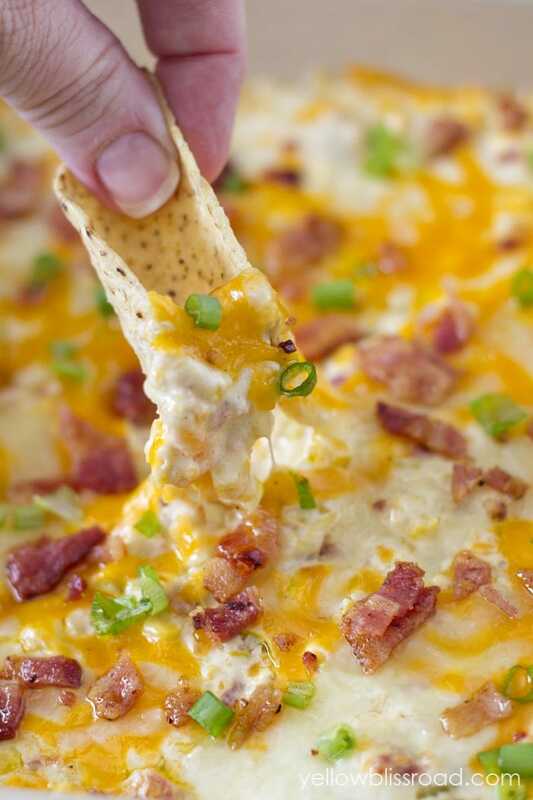 I didn’t want a completely smooth dip, but I didn’t want bit chunks of onion either, so this was perfect. The ciabatta loaf I’d bought made the perfect vessel for this hearty, creamy dip. I gave it a little crunch by drizzling it with olive oil and broiling it for a few minutes. 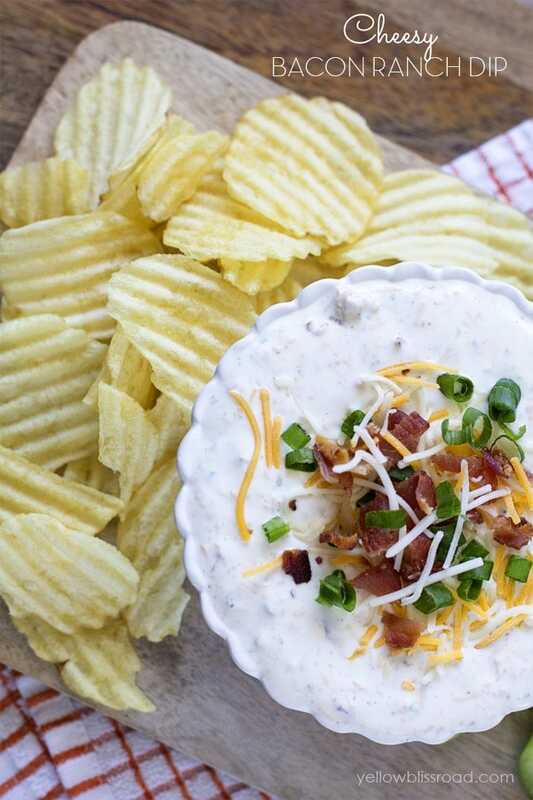 This dip would go just as well with Kettle chips or veggies sticks, or even as a topping for a baked potato! Heat 2 tablespoons of bacon grease in a large skillet over medium-low heat. Add onions to the skillet in a single layer and cook, stirring often, over medium-low heat until golden brown and soft; about 20 minutes. If the onions begin to brown too quickly, turn down the heat as they could burn easily. Once onions are caramelized, remove from heat and set aside to cool. 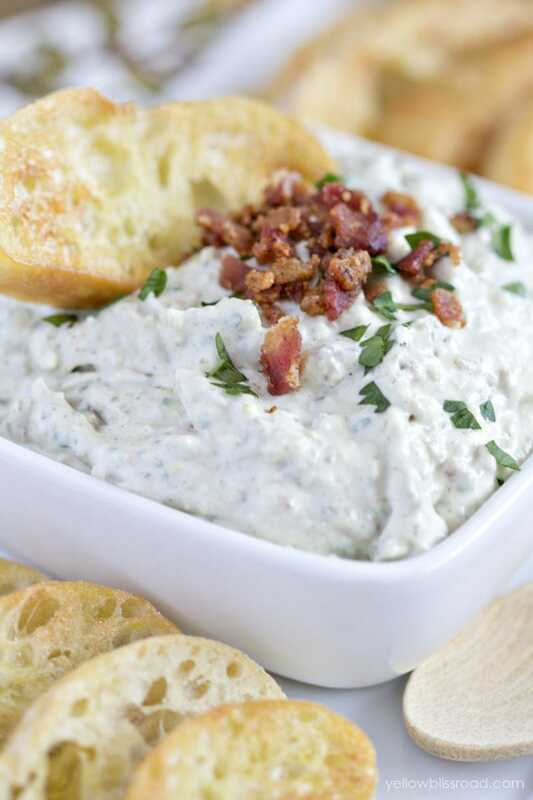 Add goat cheese, sour cream and mayonnaise to a food processor or blender and pulse until smooth. Add herbs, bacon and onions to the goat cheese mixture and pulse until you are happy with the consistency. Taste and add garlic salt and fresh cracked black pepper as needed. 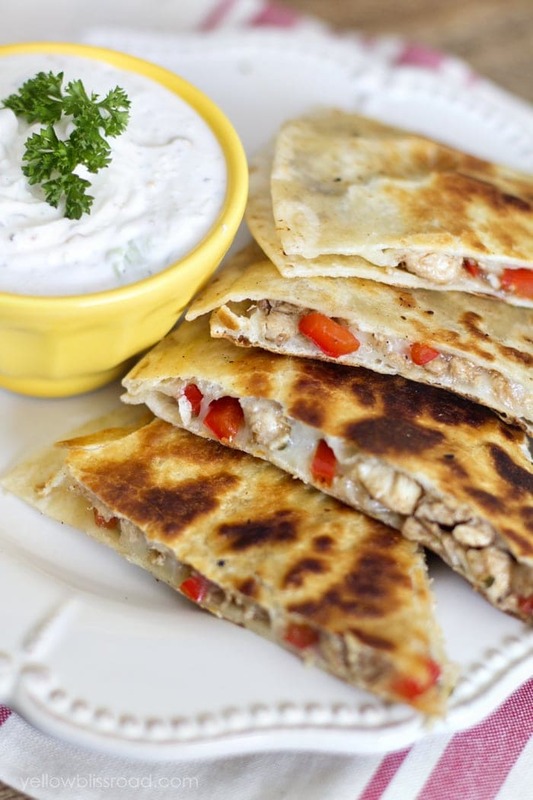 Serve with chips, crostini or veggie sticks. Nearly closed my browser at Red Robin – because let’s be honest, place is terrible. 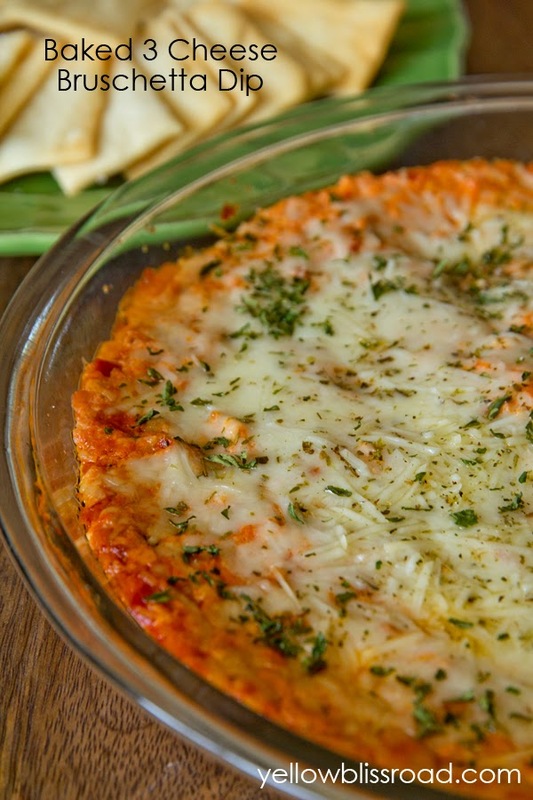 Glad I didn’t – good dip and thanks for the recipe! This is yummy… Thanks Kristin for sharing this.